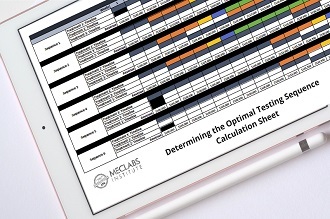 The following research was first published in the MECLABS Quarterly Research Digest, July 2014. 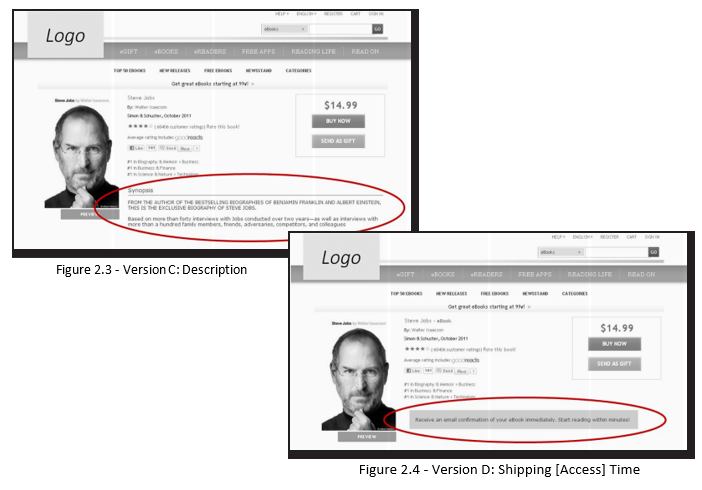 Product pages are a staple in nearly every business website in existence. Oftentimes, they represent the final hurdle before a prospect clicks “add to cart” or fills out your form. 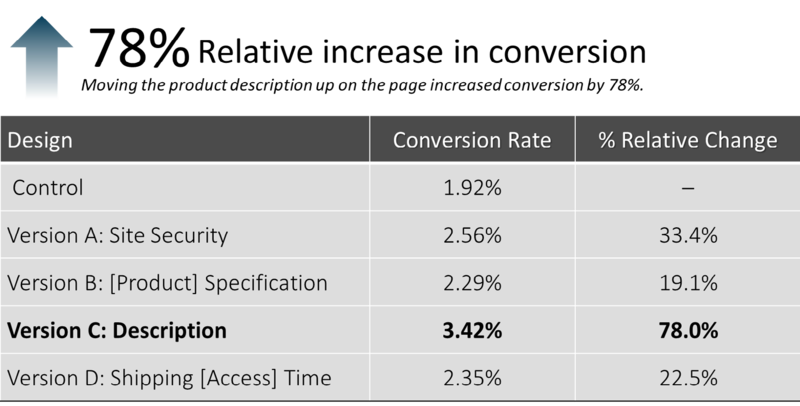 Therefore, if we can improve the performance of these key pages, we can see substantial increases in conversion and sales. Look at the three pages in Figure 1.1. What do they have in common? In our experience, when we correct for anxiety, we see gains. The needed correction often involves only simple and small changes. In the Marketingsherpa E-commerce Benchmark Study, we found ecommerce marketers are employing a variety of page elements that can be used to reduce anxiety (Figure 1.3). 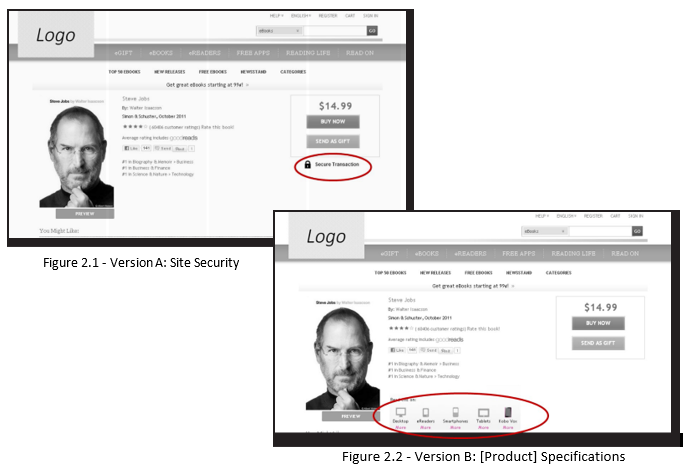 Figure 1.3 – Page elements used by successful and unsuccessful ecommerce companies on product pages. We tested four of those minor elements to correct specific points of anxiety on the same page and to help us understand the interplay of anxiety and the corrections we make. Experiment: Which anxiety correction had the biggest impact? What does your instinct tell you? Which, if any, of the corrections would most improve conversion? After our complete analysis, we discovered three key principles as to why Version C was victorious, as well as what we can learn from the success of the other treatments. Key Principle #1. 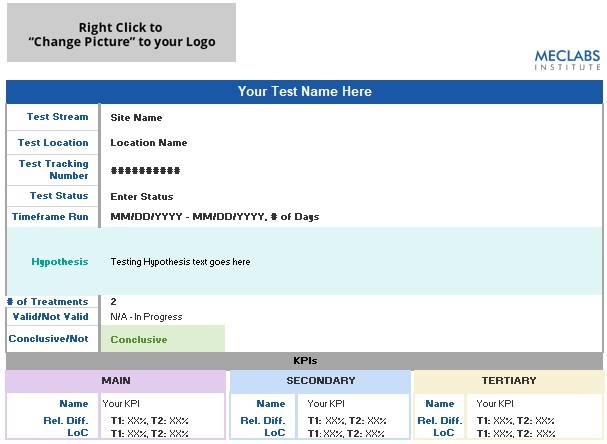 Every element we tested on the page overcorrected some type of customer anxiety, with various elements performing more effectively than others. It is crucial to note that while Version C produced the largest increase, each treatment page outperformed the control. 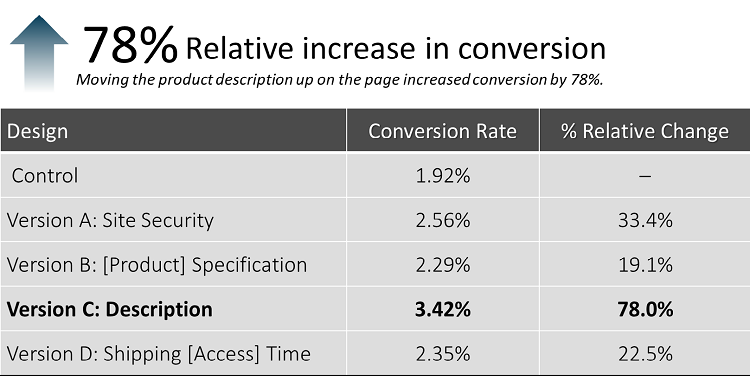 In other words, in every case where we took steps to alleviate customer anxiety, conversion went up. These results underscore the importance of this effort, as well as the relative ease with which gains can be achieved. It is important to note the use of the term “overcorrect” here because anxiety is not always rational. You may know that flying in a plane is statistically safer than riding in your car, but, for many of us, our anxiety level is much higher in an airplane. Is it rational? No. Is it still very real? Yes. You may see no reason for concern about a given aspect of your page, but that does not mean anxiety is absent for customers. Key Principle #2. 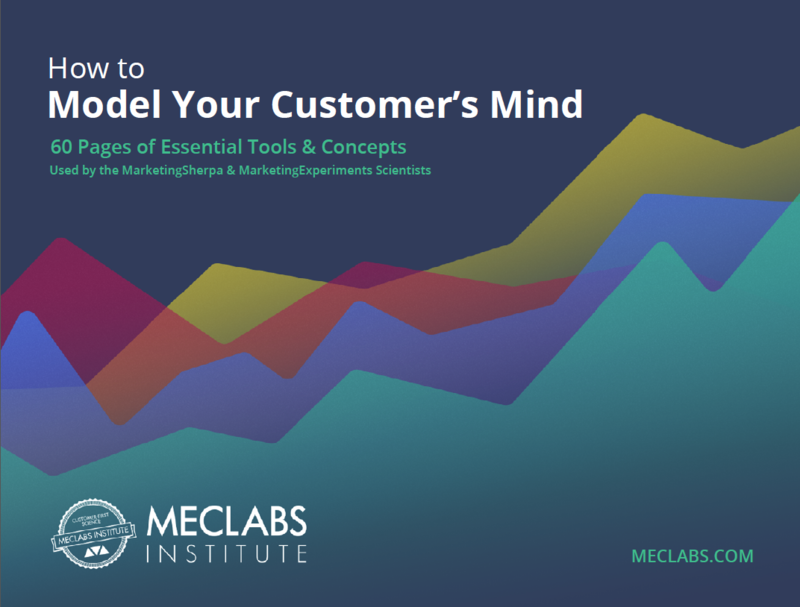 The effectiveness of each corrective is directly related to how it matched the specific concern in the mind of the customer. 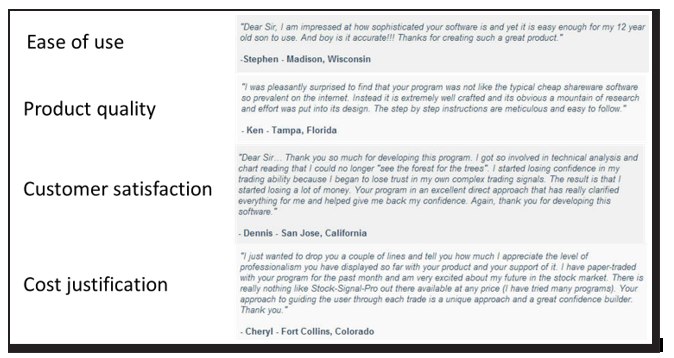 Additionally, customer testimonials can be used to alleviate several different concerns. You want to choose testimonials that specifically deal with the point of anxiety the customer is experiencing (Figure 3.1). Key Principle #3. Location plays an important role. You can more effectively correct anxiety by moving a corrective element within close proximity to where the concern is experienced. As in real estate, location is of utmost importance when correcting for anxiety on product pages. If you are correcting for form security concerns, you want the correction element right where the customer must click to submit the form. In Version C, we simply added a plot synopsis above the fold rather than farther down the page, and it led to the biggest jump in conversion. It’s not always about creating new elements, but instead, placing existing ones in a location that better serves the thought sequence of customers. Anxiety is lethal to product page conversion. It is always present, and it is not always rational. By overcorrecting for predictable or discovered customer anxiety, you will empower more prospects to complete the sale. Specificity – How specific is the corrective to the source of anxiety? Proximity – How close is the corrective to the moment of concern? This is a great piece of thoughts. We have been experimenting with a similar approach. 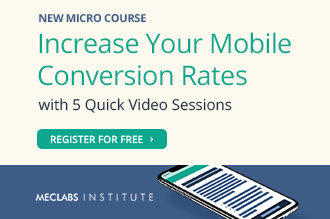 The only missing point in our case is we are not using A/B, Multivariate Testing tools yet, but exploring to see if we can use Google Optimize. Hence I am curious to know what tool are you using to test different variations? Any recommendation? Thanks in advance.